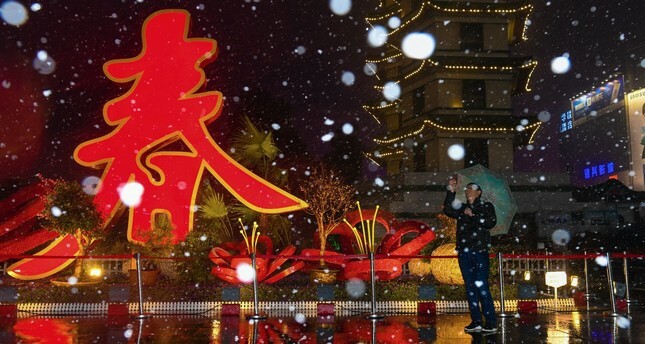 An installation with a Chinese character reading, "Spring,” in Zhengzhou, China, Jan. 30, 2019. There're a lot of events going on this month in Istanbul that are organized by and may be of interest to expats. From cultural talks to concerts and pop-up dinners to parties, check out this specially curated list of events to get you out there and having fun this February. On Feb. 1, Istanbul&I will be celebrating World Hijab Day by making it the focus of their next "Connection" event, a talk series aiming to share cultures, traditions and experiences. Istanbul&I is an organization where volunteers work on projects to assist displaced and disadvantaged communities. It also holds a number of regular educational events like public speaking, book clubs and talk series at its center in Karaköy. World Hijab Day began on Feb. 1, 2013, to stand against discrimination toward Muslim women who wear headscarves and create ways for empathy and understanding - which is the theme of Friday's event that takes place from 7 p.m. to 9 p.m. If you haven't heard of the Young Shaven, it's about time you do, because this expat-heavy post-punk group is now on the airwaves in Turkey with their single "Cig no Fire," getting regular airtime on Radyo Eksen. They kick off the month with a show tonight at Arsen Lüpen, Taksim. It will be a special dance event, which is a newer event series is titled "İndi Bindi." This will be the seventh edition of the event. In addition to performances by The Young Shaven and Dandy Island, there will also be a clothing swap, so you can bring clothes you don't want anymore and switch them for something new, while the remains will be donated to charity. On Saturday, Feb. 2, Anahit Sahne in Beyoğlu's TomTom neighborhood, will be screening a short documentary titled "Palestine Underground," which was released in 2018. It showcases the underground music scene in Palestine including techno DJs, hip hop producers and rappers from the region. Some of the artists in the documentary will be on hand for a Q&A discussion following the screening. Tickets to the event are TL 40 and available on Mobilet. The popular dinner event series, Pop-Up Dinners Istanbul will be ringing in the Chinese New Year with a special dinner and a masterclass. Run by Kay, a former restaurateur and Dutch-Singaporean expat out of her home in Cihangir, these special themed-dinners are immensely popular amongst the expat community. This month, Pop-Up Dinners Istanbul will be offering a special treat with the "Masterclass: Secrets of the Chinese Pop-Up." This rare treat of a cooking class will be held on three separate dates - Feb. 2, Feb. 3 and Feb. 9 - from noon to 4 p.m.
At the event, Kay will demonstrate for participants how she prepares a number of Chinese classics that have been favorites at her Chinese-themed dinners over the years. After spending the afternoon cooking together, participants will then take part in a shared meal. Then on Saturday, Feb. 16, Pop-Up Dinners Istanbul will host its annual Chinese New Year Dinner, unfortunately, the guest list has long been full. But, keep your eyes on the list for the next month's event, which will be a tribute to the popular television series "Game of Thrones." Spoken Word Istanbul easily one of the most popular expat events to have blossomed in Istanbul. Held every Tuesday night at Arsen Lüpen in Taksim, this multicultural open mic night is an opportunity for anyone who desires to take the stage to perform for six minutes. The event is free and begins at 8 p.m.
Casablanca Cuisine is another popular pop-up dinner series popular amongst the expat community that takes place in venues throughout Istanbul. It is run by Assia, a Moroccan expat, who will be showcasing the Berber heritage in a special event "The Berber New Year's Dinner" on Friday, Feb. 8, in Etiler. On Friday, Feb. 8, Yabangee, a web-based expat community, will be holding the 10th edition of their "La Senorita Night" at Los Altos, a chic Mexican restaurant with spectacular views in Beyoğlu's TomTom neighborhood. Ladies enter for free and can take part in complimentary cocktail workshops. DJs Mert Çetınkaya and Hande Türkmen will be playing the music and Deniz Felder will be playing the saxophone. The event begins at 10.30 p.m. and will continue until 4 a.m.
Standup Turkey is a multinational English language stand-up comedy night that takes place every month. It will be returning to the stage on Sunday, Feb. 24 at BKM Mutfak Çarşı in Beşiktaş. The show will feature eight young comedians with Asli Akbay, English-Turkish comedian and founder of the Take Me Up The Bosphorus Standup Comedy Nights as master of ceremonies. The show will begin at 8 p.m. Tickets are TL 45 and available on Biletix and at the venue. On Wednesday, Feb. 27, Yabangee will host their monthly Expat Spotlight talk series, which showcases the contributions made by expats in Turkey. Based on different themes, the event is held at ATÖLYE in Bomontiada. This month's Expat Spotlight will be a very special "Two Year Anniversary Celebration" edition where all former speakers and guests are invited for a night of networking and festivities.